Update #1: The 16GB Galaxy TabPRO 8.4 is scheduled to go live today also, but it doesn't seem to have trickled out to most retailers just yet. Best Buy currently has the smallest tablet in the PRO series available for $399.99 online, but only in white. Update #2: Alas, here is the Galaxy TabPRO 8.4 in black. Samsung's new Galaxy NotePRO tablets combine massive size with massive price, but that doesn't mean there isn't someone with fat hands and a matching wallet just waiting to give them a go. In the US at least, today's your lucky day. 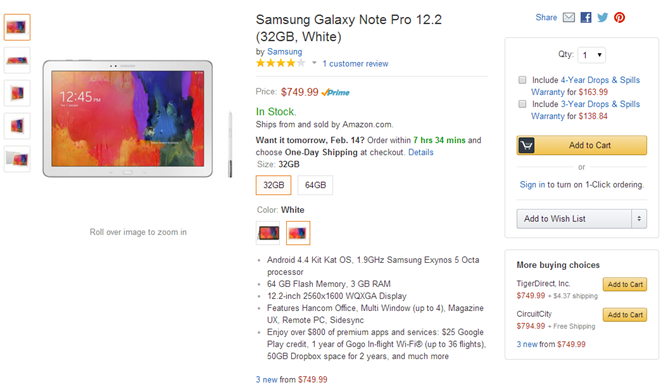 The 32GB Galaxy NotePRO 12.2 is now up for sale from Amazon, Best Buy, Newegg, and elsewhere for $749.99. The more traditionally sized 16GB TabPRO 10.1 is also available from the same places for $499.99. Both are available in your choice of black or white, and they come with 12.2-inch 2560x1600 displays and 1.9GHz quad-core processors. Other tablets in the PRO series, such as the 64GB NotePRO 12.2 and all of the TabPROs, are not yet ready, but you can pre-order them depending on the retailer. Amazon lists the 64GB NotePRO as coming on March 9th, while the TabPRO 8.4 will arrive much sooner on February 19th. I am a user of internet so from now I am using net for articles, thanks to web.